Cool selection of wasteland encounters! This pdf clocks in at 23 pages, 1 page front cover, 1 page advertisement, 1 page editorial, 1 page ToC (with statblocks by CR), 1 page author bios (nice! ), 1 page SRD, 1 page back cover, leaving us with 16 pages of content, so let’s take a look, shall we? Now this is a collection of encounters that resulted from Raging Swan Press’ open call for freelancers by various authors and come with +/- 1 EL scaling information. The encounters herein can easily be plugged into a given campaign, so from here on SPOILERS will show up. If you’re a player, please jump to the conclusion. The first encounter fits perfectly into the desolation of a desert with a minor dressing table, providing one nasty adversary for low levels PCs – a were-vulture ranger and his raptor companions. While only CR 4, be assured that this guy can be lethal – I once killed off 3(!!!) PCs with a harpy-sniper and that did not have the buff-suite and smart tactics of the ranger – a challenging encounter, especially nice for experienced groups and mostly remarkable for the damn fine NPC-build! The next encounter has a cool idea at its base – what do the small elementals do? Well, they may gather in harmless schools, extinguishing flames and harassing PCs…and if you turn hostile, you may well have to face the enraged caretakers! I *really* like that concept and the escalating conditions in the encounter. “Creeping Coins” is about the final resting place of a notorious thief, now a ghost, and his animated treasure hoard – generally nice, though also a lost chance – the encounter mentions a fascination with riddles, an illusory sphinx…but no riddle to actually ask. While RSP has enough riddle-pdfs, a sample would have been nice. “Desert Rose” is interesting – the pdfs are crossing a wadi, a dry riverbed and the onset of rain has them flee towards a ravine (and yes, flashfloods are a thing in the desert) – alas, the influx of water also revives the dry shrubbery and reactivates the deadly assassin vines – neat, especially due to the helpful, damn cool round-by-round breakdown! Realistic, cool, two thumbs up! “Lenate’s Love” is a damn cool encounter as well – a fiendish gargoyle in love with an animated statue may be too much for the PCs to handle – unless they deduce a way to use the statue’s programming to their advantage and have it help destroy the gargoyle. Tragic and still, fun and smart. “Mojepe’s Grove” can be a social or combat encounter, depending on your preference – a tribe of xenophobic, desert-dwelling halflings and their awakened cactus master. Diplomacy and combat – all possible, damn cool, two thumbs up! “The Sting of Sun and Sand” has the PCs encounter a barbarian driven mad by sun and dehydration -they can kill the man or save him and find the remnants of his caravan – where a sandstorm and giant scorpions await…nice, if a bit conservative. The final encounter, the “Vulture King” has the PCs face the remnants of a tengu-caravan turned ghasts/ghouls/etc., who, surprisingly, don’t immediately attack those stumbling into their oasis, offering to accept sacrifices for water. Grim and strange, a cool encounter especially suited for shades of grey sword and sorcery, but I wished the encounter was more of a settlement, less of a fire and forget affair. Editing and formatting are top-notch, I noticed no significant glitches. Layout adheres to Raging Swan Press’ 2-column b/w-standard and the pdf comes in two versions, one optimized for screen-use and one for the printer. Both are fully bookmarked with nested bookmarks and the pdf sports multiple gorgeous b/w-artworks. Mikael Berg, Fabian Fehrs, Mark Hoover, Kiel Howell, Jacob W. Michaels, Jens Demandt Mouritsen, Christopher Wasko, Nick Wasko, Daron Woodson – congratulations, gentlemen – there is not a single boring encounter herein. While not all blew me away, the vast majority of encounters herein have something utterly unique going for them. Idea-wise, this is definitely an inspired supplement and showcases well the talent of those involved. My final verdict will clock in at 4.5 stars, rounded up to 5, with a special shout-out to Desert Rose, Lenate the Lovesick, Children of the Sky and Mojepe’s Grove – I’ll be sure to use these! 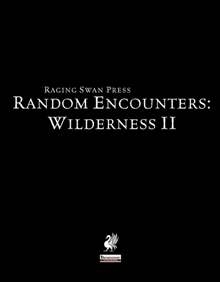 You can get this cool collection of encounters here on OBS and here on d20pfsrd.com’s shop.